To recap for new readers, my house was foreclosed, vacant and vandalized for years before I got it and needed everything while I had almost no funds. So, there was a dishwasher. Yeah! Not really. It didn't work and had pieces hanging off it, was filthy, really old and an eyesore. I wanted it removed for several years, but I was intimidated by the plumbing aspect and didn't think I could physically get it out. I got no help, so there it was, ugly and wasting precious cabinet space. One day I screwed up my courage and tore into it. Hated even touching it, it was so icky. Well, I got it past the point of no return and couldn't go farther. I called a sister-in-Christ who had a handy husband and, God bless Bobby, he came over - from another town!!! and he finished pulling it out and got it to the road for me. God bless you Bobby where ever you are! :) Now what did I see? A huge cavity in my cabinets! I couldn't get a new one; couldn't have afforded to run it even if I had one (they cost a lot in utilities). But I saw cabinet space, which was sadly lacking in my old kitchen. Back to Lowe's or Home Depot - I used them both. And I told them I wanted to build a shelf in the middle of it. They helped me figure out how to do it and though actually doing it was a bit tricky, with God's help I did it and stained it all to match! I measured for doors to cover it and got matching hinges and knobs. Sadly that part didn't go as well. I just wanted flat pieces of wood that I'd stain to match the cabinets. That would be good enough for me. Apparently it would take equipment I didn't have and so a man working there said he'd do it for me and to leave the stuff with him. Yup, that was the end of that, God bless him. But I have been so blessed with all that extra storage space all these years! Would be nicer if there were doors to hide it away, but this is GREAT! And a last thought on those old kitchen cabinets...way too expensive to replace the doors to update them, but just replacing the nobs with simple brass ones for $1.98 completely changed the feel of the room. Soooo nice! The total cost was almost nothing and time spent wasn't bad. And how is this inspirational? We are to be good stewards of all God gives us! This is not only saving money, but recycling! Praise the Lord in ALL THINGS! If you'd like more of these, let me know and have a super day! 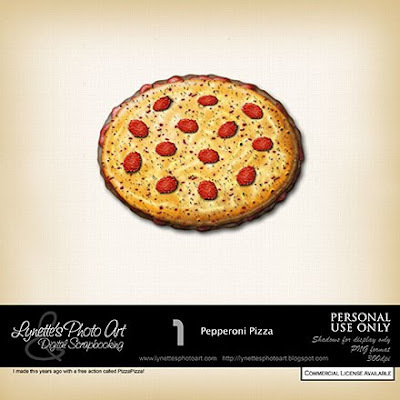 Today I'm giving you a Pepperoni Pizza for all your summer picnic & party LOs. I made this years ago using a free action called PizzaPizza! Thank you! Your blog post will be advertised on the DigiFree Digital Scrapbooking Freebie search engine today (look for timestamp: 31 Aug [LA 07:00pm, NY 09:00pm] - 01 Sep [UK 02:00am, OZ 12:00pm] ). Another yummy gift, than you! Thank you for this wonderful freebie! I admire your designs, and that you mix it in with your faith. I love saying "Jesus Christ is Lord" while typing it, its a great pick-me-up. A good Christian group, who is now disbanded, is The Truth. If you can actually find their stuff on the web, you will be lucky. Their best album is More Than You'll Ever Imagine. That album has got me through alot ever since I first heard it as a kid. I'm starting to put on weight with all the yummy food Lynette, think I might have to switch from Pizza to Salads for a while - lol. Thank you. My two year old niece is going to turn into a pizza with all of it that she eats. This is perfect for some of the photos I have of her with her mouth stuffed with pizza!